St. Nicholas, Adare, is in many respects the anchor church of the group of parishes. It shares a rich history with the village of Adare, a small and attractive village just southwest of the City of Limerick. The history and ongoing life of the church and the village are intertwined. The building was originally built in 1315 as an Augustinian Abbey. It is also called the "Black Abbey" because the Augustinian monks of the time wore black habits. Put into ruin in the mid-1500s, the church was restored in the 19th century as a worship place for the Church of Ireland, through the generosity of the Earl of Dunraven. St. Nicholas is also the home of St. Nicholas National School, a primary school that in 2014 celebrated its 200th anniversary. The school is coeduational and under the patronage of the Church of Ireland, but welcomes children of all faiths. St. Nicholas celebrated its 700th anniversary in 2015. The main event was a Festival of Faith and Flowers on the weekend of 22nd–24th May. Check the Festival page HERE. The photo above is of the cloisters at St. Nicholas, taken by John Holmes of the Limerick Camera Club. An Audio Guide to St. Nicholas Church is available. It begins at the entrance to the church grounds at the outside gate and lasts about 30 minutes. It explains the history of the church and some of the most important features. Go HERE to access the Guide. Television coverage of the 700th anniversary celebration of St. Nicholas appeared on national television, on Nationwide, and on Limerick County Matters (beginning 5 min 39 sec into the program). 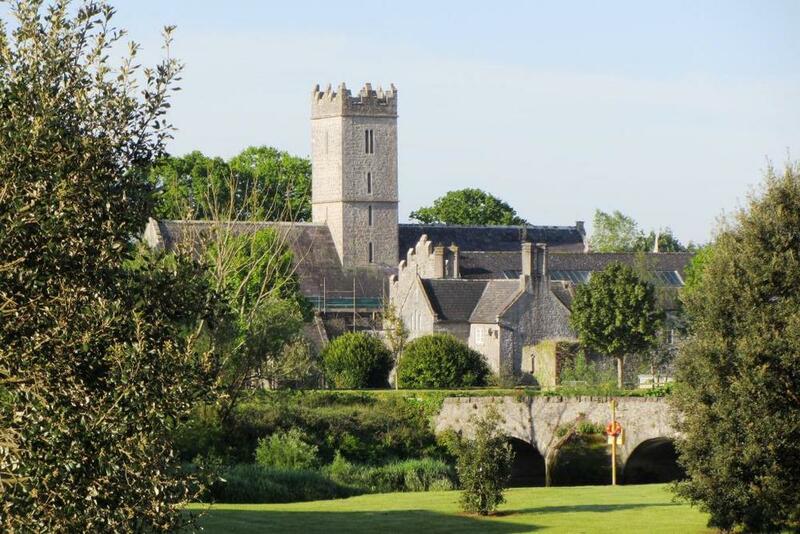 St. Nicholas Church and the bridge going into the village of Adare. Photo courtesy of Liz Burke. Guided tours of St. Nicholas are available by appointment, rather than being offered on a regular schedule. To arrange a tour, email HERE or phone (061) 396227. Please indicate how many people are in the group and what language they speak. The tour is conducted in English. The suggested donation is €5.00 per person, or free with the purchase of the book Adare: The Augustinian Friary & St. Nicholas Church (€20), by Barbara Bingham. Proceeds benefit the restoration of the church.